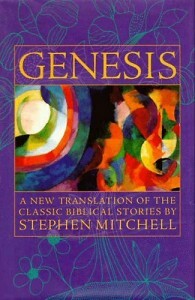 Stephen Mitchell has turned his attention to the book of Genesis, one of the most influential books in human history. In Genesis: A New Translation of the Classic Biblical Stories, he embodies in English the simplicity, dignity, and powerful earthiness of the original Hebrew. He also gives the text a stunning new clarity by separating into their sources stories that were combined by scribes centuries after they were written and omitting all the verses that are recognized as scribal additions. This immeasurably strengthens the original stories; it is like removing coat after coat of lacquer that has obscured the vibrant colors of a masterpiece. The scribal additions are fully translated in an appendix and extensive textual notes. In his introductory essay, Mr. Mitchell puts the historical Genesis in context and explains its importance as a central story of the human spirit. And Abraham hurried into the tent and said to Sarah, “Hurry, take a bushel of our best flour, knead it, and bake pita.” And Abraham ran to the herd, took a fine, plump calf, and gave it to a herdboy, who hurried to prepare it. And he took yogurt and milk and the calf that was now ready, and set it all before them; and he stood by them under the tree as they ate. And Sarah lied and said, “I didn’t laugh,” because she was afraid. And early in the morning Abraham saddled his donkey, and took two of his men with him, and his son Isaac, and the wood that he had chopped for the sacrifice, and set out for the place that God had spoken of. And Abraham took the wood for the sacrifice and put it on his son Isaac. And he himself took the firestone and the knife. And the two of them walked on together. And the two of them walked on together. And they came to the place that God had shown him. And Abraham built an altar there, and arranged the wood, and bound his son Isaac, and laid him on the altar, on top of the wood. And Abraham reached out and picked up the knife to slaughter his son. And Abraham looked up and saw a ram caught in a thicket by its horns. And he went and took the ram and burned it as a sacrifice instead of his son. And he named that place Yahweh-yireh, Yahweh Provides. And Abraham went back to his men, and they set out together for Beer-sheba. And Abraham stayed in Beer-sheba. An authentically fresh, surprising, and winning translation… The translation throughout shows the hand of a master craftsman, who can make the American language do God’s work, as much as Hebrew does. Breaks fresh ground… Mitchell’s translation tells the stories in a voice much like the ancient Hebrew, without adornment. Mitchell’s admirable and enjoyable translation conveys, with remarkable clarity, these compelling, strange, and powerful stories. A powerful reminder of how much Genesis has to teach us. Readers who know the best-known English translation, the King James version of the early seventeenth century, will find that … Mitchell’s renditions are like breaths of fresh air rustling through that version’s musty pages. Stephen Mitchell reenters the ancient Hebrew context, examines the stories’ original text and separates the layers of scribal additions from the original material. The result is a series of stories, each clearer and more precise, each truer to the original intent, than we might have previously experienced them. Mitchell’s sensitivity to the original Hebrew language and the history of biblical scholarship is evident in his carefully written work. But it is his overwhelming concern with contemporary relevance that marks this translation. Those interested in new means of situating the spiritual message of Genesis will likely welcome Mitchell’s phrasings and interpretations.